The log files for the OTA / HTNG interface can help you determine what happened if you experience any problems. To reduce clutter and disk usage, logs are limited to the most recent 250 messages. Each message will produce 4 log files, detailed below in the "Log File Locations" section. This is new and probably has bugs. Please email support if you find one. Because the interface has several logs with different types of data (XML, Plain Text, etc.) they are difficult to read and make sense of. This log viewer should help you decode the riddle wrapped in the mystery inside the enigma of the log files. This application is located in the PMS software folder. If you can't find it, you can download it by CLICKING HERE. Extract the contents to the PMS software folder. After you open the log file viewer you'll see that all the fields are blank. You'll need to click the Read Logs button at the top left. Click it ONLY ONCE!. The status bar at the bottom will let you know when it's finished reading the log files and if any were found, you should see a list of reservation records. If a name or confirmation number is missing, that means it was either missing from the log file (names are not sent with cancellation records) or the log file wasn't found. Double - Click the record on the left to see the details from each of the four log files. They are shown in the order in which they are processed. If a log file is missing, you'll see an Internet Explorer type message telling you the file can't be found in the appropriate window. Request From CRS is the XML message received from the CRS (TravelClick, Synxis, etc.). Request To PMS the interface parses the XML and submits the appropriate data to the PMS. Response From PMS the PMS processes the request and returns a response. If there is an error, it's returned, otherwise it returns the PMS confirmation number followed by the letter "S" for "SUCCESS"
Response To CRS the interface formats an XML response to send back to the CRS. This log lacks some of the login credentials required to submit a standalone response. The interface adds these credentials after the log is created. If the response log file is found, you can resend it. This may be helpful if the CRS didn't receive a response to a request. If resending is available you will see the green button. Click it once and the response message will be resent within a few seconds. 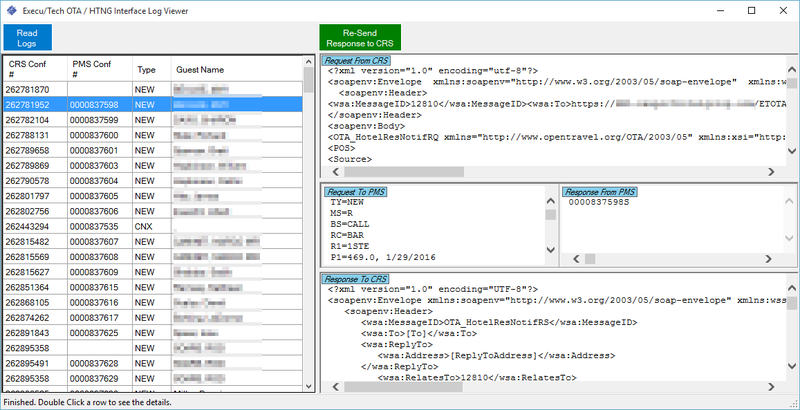 Logs for the OTA / HTNG interface are saved in the Request (RQFiles) and Response (RSFiles) folders. These are the locations of the different logs. RQFiles\Log XML messages posted from the CRS to the PMS interface. RQFiles\Log\ToPMS Messages posted to the PMS by the interface. RQFiles\Log\FromPMS Message posted back to the interface by the PMS. RSFiles\Log XML messages posted back to the CRS from the interface. yyyy = The year as a four-digit number. MM = The month, from 01 through 12.
dd = The day of the month, from 01 through 31. HH = The hour, using a 24-hour clock from 00 to 23.
mm = The minute, from 00 through 59.
ss = The second, from 00 through 59.
ff = The hundredths of a second, from 00 through 99. These are the codes sent in the messages to the PMS. The messages received from the PMS are very simple. The first 10 characters are the PMS Confirmation Number. (Missing) = The PMS was unable to respond within 10 minutes and the reservation may not have been updated.